TWW - The 10th Annual TWW Easter Egg Hunt!!! Stories » The 10th Annual TWW Easter Egg Hunt!!! The 10th Annual TWW Easter Egg Hunt!!! It's time for the 10th Annual TWW Easter Egg Hunt! The contest will start on Tuesday April 19 at 5:00 PM and will end on Wednesday April 20 at 5:00 PM. The winner will receive a full year’s premium subscription! UPDATE: Congrats to 2011 Egg Hunt Champion puck_it. See you next year! "Tuesday April 19 at 5:00 PM"
what size are they? can someone post a screenshot of what to look for? what's with the retarded dates? What time do you have to work bb? Multiple winners again this year? Will this work for firefox users with adblock? i clicked an egg i saw at the top of the home screen that said click on eggs...and it took me to this page...did i win? attn users with <1000 posts...i know. but how do you win? seems like i didn't win...sorry for being a newb. ^Well, first off, the hunt doesn't start until 5pm today. Pretty much as you browse TWW, randomly an egg will show up on your page. You can't miss it either. They stand out on the page. You click on it, you confirm it and then it's added to your score. All you have to do is catch the most before 5pm Wednesday. Pretty simple. 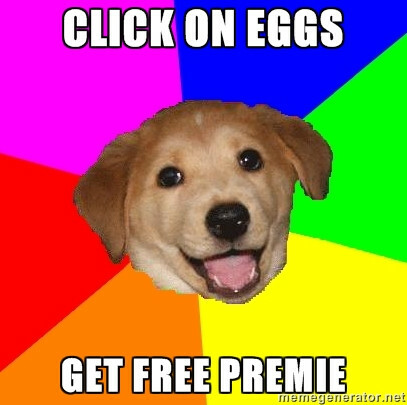 "Pretty much as you browse TWW, randomly an egg will show up on your page." So would you have to scan every page of a thread, or would it be just at the top and the most recent? Do you need to click back to pages you've already been on? Is this really the 10th annual? I thought it didn't start until 2002 or maybe 2003. Isn't this one of those competitions you don't want to be known for winning? Like, find the pumpkin for halloween or find little pictures of wolves or flags or something. ooooh, maybe for Presidents' Day we can play "find Obama's Birth Certificate"